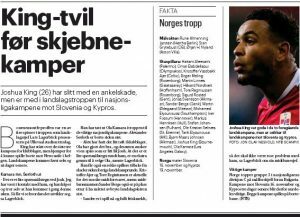 Norway face Slovenia and Cyprus in the UEFA Nations League later this month and Lars Lagerback has included AFC Bournemouth?s Joshua King in the squad for the two international fixtures. An ankle injury has forced the 26-year-old to miss the Cherries’ last three matches in all competitions, which included his side?s 2-1 defeat at the hands of his former club, Manchester United. 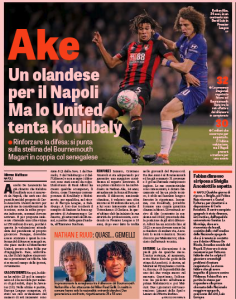 Eddie Howe’s side will next face Newcastle United and according to Aftenposten, the forward is ?struggling to play? against the club. Despite the player’s injury situation, his national team coach has included King in the Norway squad as he remains hopeful the attacker will be fit in time to represent his country. “He still has a bit of pain in the foot, but is quite positive. I hope and believe it will work, but there is a small question mark,? Lagerback said, as quoted by football.no. King has been one of the better players for Bournemouth this season, directly involved (four goals and an assist) in 25 percent of his side?s goals scored (20) in the league. The post Bournemouth player ?struggling to play? against Newcastle, included in national team squad appeared first on Sport Witness.